Into the unknown, originally uploaded by nina_theevilone. Well, not really. Myanmar or Burma is not as popular a tourist destination as its next door neighbors China and Thailand, but it remains a favorite amongst travelers who has visited the country. 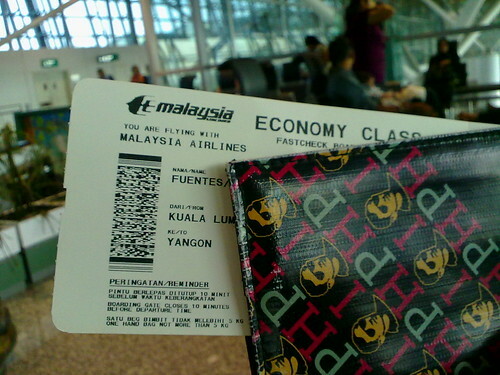 Burma is the last country in the ASEAN that I have yet to visit, but that’s to change in a couple of hours. I am both excited and scared. A thousand scenarios are going through my head, but from past trips, I know that I am just being paranoid and everything will be alright. I think it’s the lack of Internet that scares me the most. Air Asia flies from KL to Yangon, Flip. Go na! Your last sentence re lack of internet made me smile. I am, most of the time (my friends know this)…paranoid…and internet is my quick fix when paranoia attacks. Stay safe in all your travels. Woohoo! I have (very slow) Internet! It’s amazing here Chichi! You and Lois should definitely come! your Cambodia-Thailand trip was very helpful, thanks a lot. we’ve been there two weeks ago, though we saw Vietnam first. Looking forward to your Myanmar posts. It was only last night that i suggested this place to my travel buddy as our next destination. Have a safe travel always..
How timely that you visit the country just as Aung San Suu Kyi is released from prison. Yeah! She was released just days before I arrived. Some friends have been concerned that there were some trouble in certain parts of Myanmar, but I haven’t felt anything off in the 3 cities I’ve been to. is there a visa required ba to visit Myanmar? I can’t seem to find any info about it. thanks! like what everyone said, nakaka-inggit ka talaga nina. sana i will do what you are doing someday. isa kang alamat! Chyng, masyado kang natuwa ah! Salamat, James! Ikaw rin naman kahanga hanga eh! By the rate you’re ticking off country after country in the list of UN, you’d be well on your way to completing the list by the time you’re 40.
sorry te, nangengelam ako sa comments mo. im just so happy for you. graduate ka na sa ASEAN! YES! Pero di pa ako graduate sa Southeast Asia! It was! I had a blast in Bagan! really amazing .. dyan yung tour namin this coming january but sadly i can’t join .. but when i red your blog pakiramdam ko nkapunta na din ako dyan ..